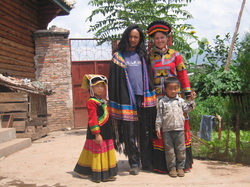 On November 18, 2008, Anzi and Veerle got married in his village according to traditional Black Yi customs -- an extraordinary celebration where east and west came together. “My family and best friend were present at the ceremony, which lasted three days. They all knew, even though life was tough, that I was happy here with Anzi. I have never laughed so much in my life as during my wedding days, complete with culture shocks, slaughtered pigs, water fights, and traditional chases. It’s in magical Yangshuo that Veerle got the inspiration to write The Fire of Dawn. She founded her own business which offered teachers the opportunity to get an internationally recognized teaching certificate. “It was hard work. I worked sixty hours a week and had to take care of my family. Doing business with Chinese people is difficult for foreigners and very frustrating at times. Dealing with different ideas about quality control and the endless brown nosing in order to get on the good side of important government officials is something that I’m definitely not cut out for.” When her father passed away in September 2009, after a long battle with cancer, Veerle sold her share to her Business partner. “My goals in life suddenly became clear. It was at that moment that I really chose for a life in China. I was no longer stuck in my adolescence and found peace. I realized that I was free. Life is too short to be stuck in a job you don’t like. I live here without restrictions. Without clichés. Here, I don’t experience the pressure I would feel if I lived in The Netherlands, striving for a succesful career and being successful. I am allowed to swim between two cultures and that feels awesome.” In three months time, she wrote The Fire of Dawn, the first in a series of young adult fantasy novels. “I was possessed by the characters in the story.” Even as a child, Veerle scribbled as though her life depended on it, fascinated by fantasy tales like ‘Lord of the Rings’. Although completely fictional, The Fire of Dawn reflects on Veerle’s journey; from feeling the bitter taste of alienation as a teen to following her heart.